I love trying new recipes and making novel dishes for company, but like everyone, I have a few tried and true favorites that I fall back on in a pinch. And call me a show off, but I love to serve my homemade and homegrown goodies. And I’m a total Egg Show-Off. So when possible, I serve at least one item featuring the beautiful eggs produced by my beautiful backyard flock. Sometimes it’s a simple Caesar dressing as a first course for a steak dinner, while on other occasions the eggs take center stage, as is the case when I prepare a brunch frittata or quiche. 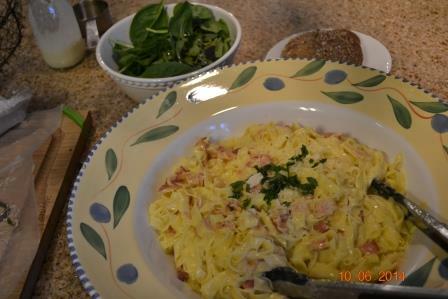 A recent Egg Show-Off favorite—that also happens to be a full blown homage to my chickens and all they produce—is homemade pasta with fresh Carbonara sauce. Carbonara sauce over home made pasta is my current favorite egg show off dinner! 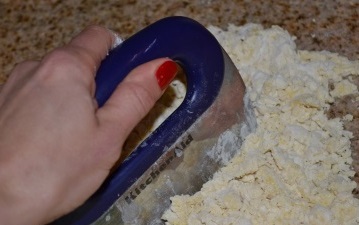 Some people make the dough for pasta in a food processor but I prefer to get a good forearm workout. Plus, I think the time gained by using a machine is just about canceled out when you take into account the cleanup. 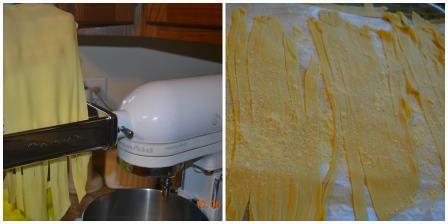 No matter how you do it, though, preparing homemade pasta adds a lot of legwork to this meal. 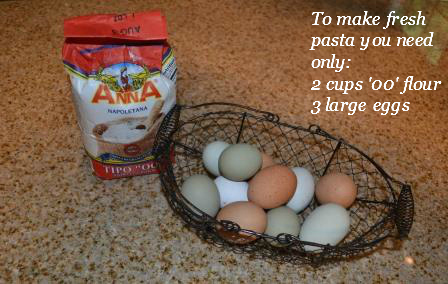 You can use boxed spaghetti or go to a local pasta shop for the fresh variety if you prefer (but then you sacrifice an opportunity to show off your glorious eggs!). 1) Measure 2 cups flour into a mound. My favorite flour to use when making pasta is ‘00.’ Of the Italian flours, graded by how finely they are ground, ‘00’ is the most finely milled. Only one grocer in my town carries ‘00’ but it is worth the special trip as it results in perfectly, silky smooth pasta. I love the pretty colors my girls lay! 2) Next, make an indentation in the center of your mound—make sure it is large enough to contain three cracked eggs. You don’t want an overflow. 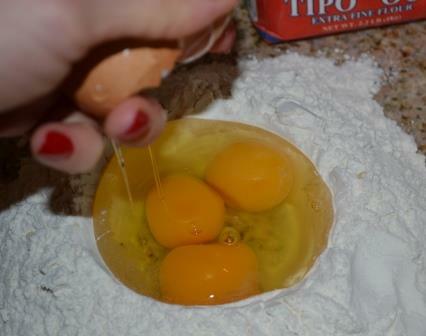 3) Crack three large eggs into the crater. A large egg is about 2.0 oz, up to 2.15 oz. You can see on our website how to cook with different sized eggs–even bantam eggs—such as you might get from your backyard flock. A digital scale will give you an exact measure or you can wing it and add a small amount of water or flour if your dough isn’t working well. The color of your yolks is one way you can be an egg show-off. 4) Here’s the delicate part: Pierce the yolks and start gently (with a fork) beating the eggs, folding in a small amount of flower from the inside edge as you beat. Combine the eggs and flour in this way until it’s difficult to incorporate more flour. 5) A dough blade is helpful but not necessary—it’s great for working the dough during the last stages of mixing the eggs and flour together, when your fork can’t too stand up to the task. A dough cutter (aka blade) is a great tool to have on hand. 6) Once enough flour is incorporated and you can handle the dough, begin kneading; and do so until it is supple (about 5 minutes in all.) As you’re working, determine if you need to add small amounts of flour or water. The dough should not be sticky and should give you good pushback, as you will have to work it through a pasta cutter. If it’s too tacky, add a sprinkle of flour; if too grainy or hard to knead, add a few drops of water. 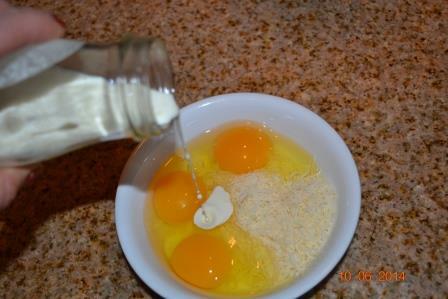 (Using homegrown eggs with their big yolks, you may well need to add an extra sprinkle of water to get it just right.) Once you’ve achieved a firm and smooth texture, form into a flattened disk, cover in plastic wrap and set aside – you can leave it to rest for 30 minutes up to several hours. 8) As you work with each segment, run it through the thickest setting of the flattener, then fold it into thirds and run through the flattener again at the thickest setting, repeating a few times until it is thin and smooth. Then run through at incrementally thinner settings until you achieve the desired thickness. I like a thickness of 6 or 7 (out of 8). Keep the flattened sheets of dough from sticking to one another by using a drying rack or laying them on parchment paper. 9) When all the sections have been flattened, switch to the dough cutting tool and run each sheet through to create linguine. I dredge the final pasta in cornmeal to reduce the risk of it sticking together – the corn meal falls right off in boiling water. Turning our attention to the sauce, this decadent classic will highlight your delectable homemade pasta. It is rich and sumptuous and perfect for spoiling your friends on a cool, autumn, Friday night. It also comes together in a snap. Even the assembled ingredients allow you to be an egg show-off–look at those pretty shells! 1. Set a large pot of water to boil for the pasta. Add a handful of kosher salt. 2. 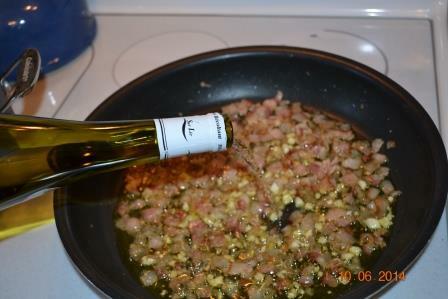 Start the sauce by sautéing the bacon bits in the olive oil until crisp (about 8 minutes on medium-low). Then add the garlic, sautéing until fragrant, about 30 seconds, then add wine and simmer until reduced slightly, about 8 more minutes. Remove from heat and cover to keep warm. 3. Beat the eggs, cheese and cream together and set aside. 4. When the water boils, cook the noodles. 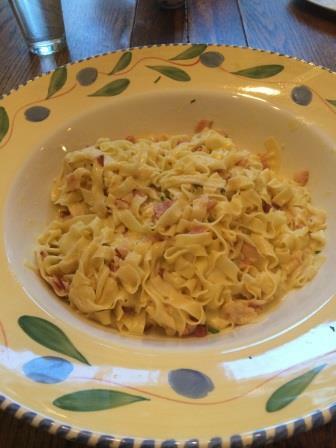 They should take just a few minutes to achieve al dente. 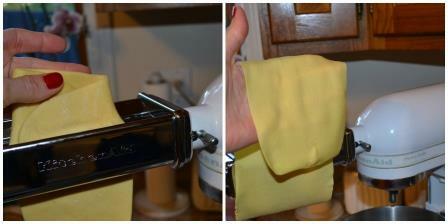 Drain the pasta, leaving slightly wet, and reserve a half cup of the starchy water. 5. 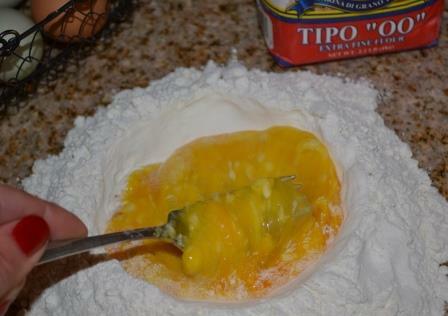 Return the pasta to the cooking pot, add the egg mixture immediately, stirring constantly as you do. If dry, add a small amount of the cooking water. 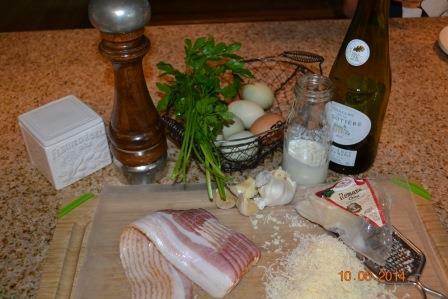 Pour the bacon mixture over the pasta and toss to coat. Season with pepper and salt (be careful not to over salt – keeping in mind the bacon and already seasoned pasta cooking water. 6. Sprinkle with Romano and parsley. Serve immediately. Serving this dish can make you a total egg show-off! I serve the meal with crusty bread and a light salad. It is a rustic yet rich and satisfying, dare I say eggceptional dinner, and it is a great way to show off your eggs. Do you have any favorite egg-recipes you use when you want to wow friends? Let us know what you like to serve in the comments sections below. Thanks! I would probably substitute low-sodium chicken broth in place of the wine. Let us know how it works out if you try it! WOW this looks good! Yummy for my tummy!